Calling all social media enthusiasts (especially those who want to up their Instagram game) – we have a place for you to photograph to your heart’s content! 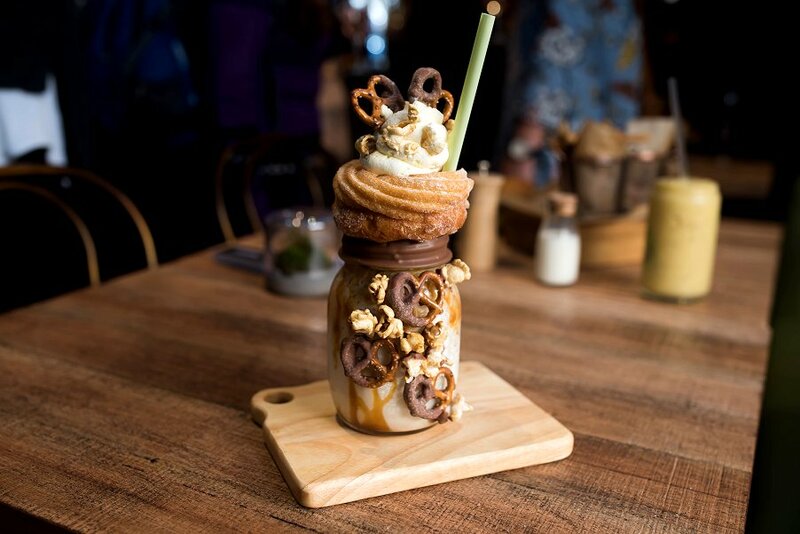 Gaining inspiration from a New York dessert place with decadent options, co-owners Simon Flocco and Anthony Canova decided to bring their own version of a dessert-filled heaven to our very own little South Australian suburb of Hyde Park! Named after the postcode of the location, 50SIXONE offers its customers with the opportunity to try and enjoy the most delicious combinations of sugar-filled goodness that are not only pleasing to the eye but also so very pleasing to the sweet tooth in all of us! The menu boasts of a number of mouth-watering options of all-day breakfast and lunch, which includes food and drinks that will dress to impress! The team at Adelaide Food Central was invited to the media launch, where all food and drink was provided free of charge. As part of the launch, we were fortunate enough to sample some of the items from the menu. We tried the crispy corn fritters with bacon relish, avocado, baby spinach, and balsamic glaze. It is most certainly as delicious as it sounds. Mix avocado and bacon together and you’ll have all my attention without a doubt! The flavours of the greens, meat, and the glaze worked well together. The softness from the toppings complemented the crunchiness from the fritter and it is certainly a dish I’ll want to have for lunch one day, when I visit again. 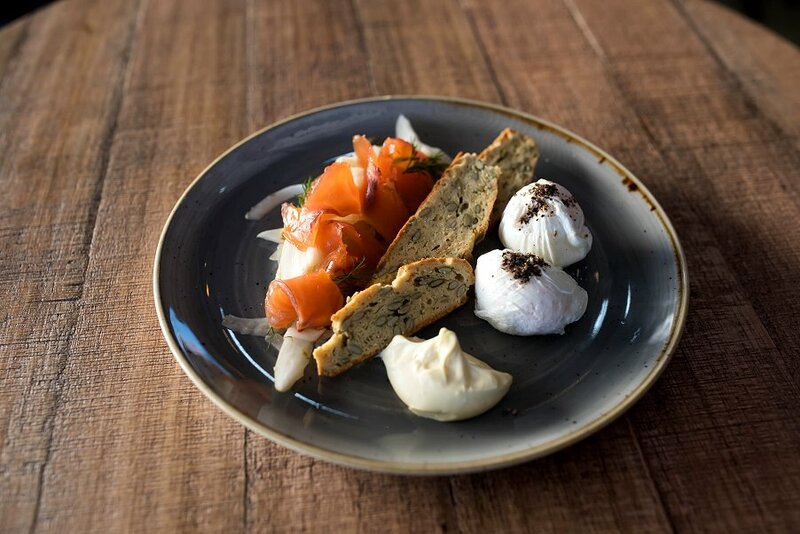 We also sampled the Lemon Cured Salmon with pickled fennel, mascarpone, and poached fresh range eggs, nestled against white pepper pumpkin seed biscotti. I loved the citrusy flavour that was oozing out of the salmon and that mixed well with the pickled fennel. While it was bite-sized, I’d be interested to try the real deal because it looked very appetizing. Next up, we were offered 50SIXONE’s signature Red Velvet Pancakes with mascarpone cheese, topped with berry compote, ice cream, and chocolate brownie soil. If you’re a fan of the sweet stuff and aren’t concerned about what time to let the sugarholic in you let loose, then this is the perfect dish for you! While it may sound too sugary to handle, it was actually fairly subtle in the sweetness factor. The cheese counterbalanced the ice cream and the chocolate beautifully. The berry compote was fresh and was a great addition to go with the red velvet pancakes, giving us a brilliant dessert dish! We were then served with the ice cream sandwich with Belgian chocolate, crushed peanuts, house-made vanilla ice cream and two chocolate chip cookies. Whether you’ve had the ice cream sandwiches at the markets before or are new to this trend, this sandwich was another crowd pleaser and definitely another dish worth checking out! The crisp peanuts and the cookies complemented the ice cream and chocolate and the bite-sized portion was perfect to enjoy as a snack. In the drinks section, we sampled items from their smoothies and milkshakes range, and each drink took our breath away with their presentation, followed by their taste. The Oreo Glad To See Me was a cookies and cream milkshake with a magnificent take on the classic favourite – Oreo biscuits. 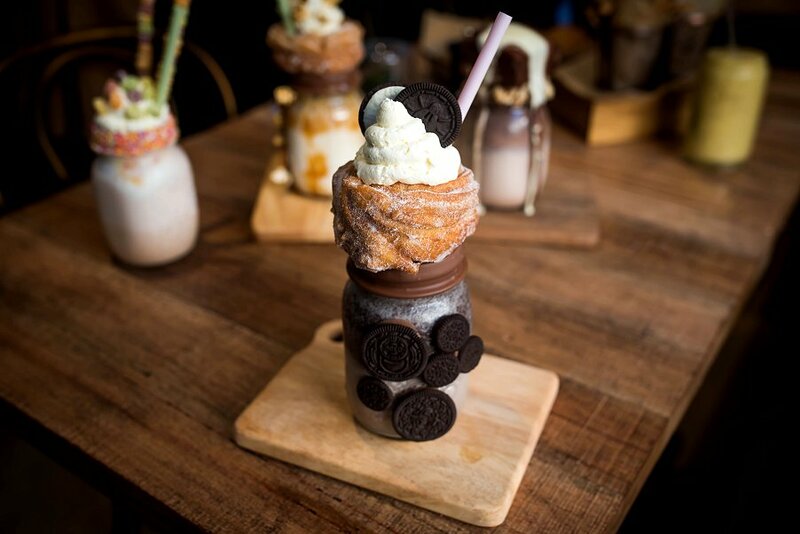 The cronut with whipped cream served on top is a beautiful added touch that further makes this drink appetizing and a meal in itself. The Pretzels for President was a salted caramel smoothie with bits of pretzel attached to the different parts of the jar. The sweet-and-salty combination of flavours was almost orgasmically pleasing to our palates. Last, but most certainly not the least, was the Meringue A Tang, a wild berry smoothie with coconut milk topped with crispy meringue. As a huge meringue fan, this was my personal favourite of the lot! 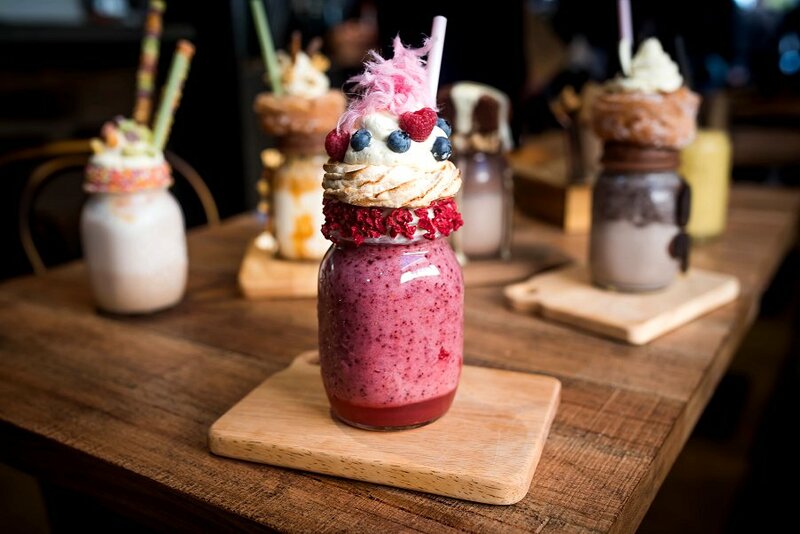 The fairy floss on top is such a fantastic addition to this berrylicious drink. You can taste the freshness of the berries in the drink, which when coupled with the crispy meringue on top makes your mouth feel like a real party is coming along nicely! 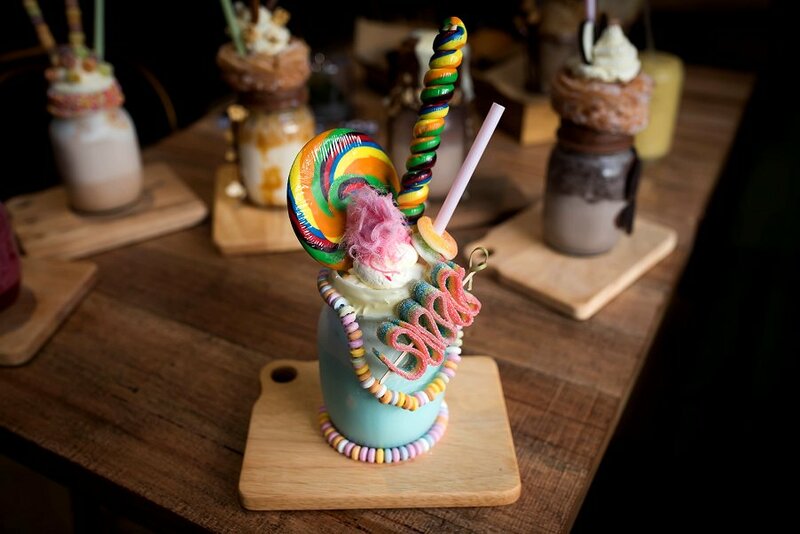 50SIXONE is hoping to revolutionize the dessert industry in Adelaide through their decadent desserts and ice creams (some of which are laced in expensive shreds of 14 carat gold foil, rich dark chocolate, and camels milk at $55 per paddle pop)! There are also gluten-free and vegan options available, and by the looks of most of their dishes and drinks, it looks like 50SIXONE is all about having fun with the ingredients and creating new creations of pure joy! Opening on July 17, be sure to stop by this dessert bar and check out their awesome menu, which is only going to get bigger and better with time! I needed this on July 15! Will have to roster in another dessert bar dinner.